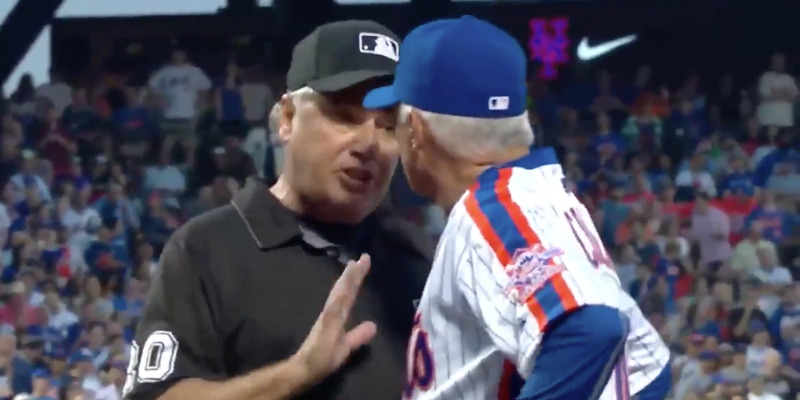 @JoeGiglioSports / TwitterA video of Noah Syndergaard and Terry Collins getting ejected from a 2016 game has been making the rounds, and it shows the intensity of home plate interactions between managers and umpires. A video of an MLB ejection with a mic-d-up umpire from 2016 is going viral, and the clip gives a fascinating insight into the interactions between umpires and managers. The clip shows Mets pitcher Noah Syndergaard and then-manager Terry Collins arguing with crew chief Tom Hallion about Syndergaard’s ejection. Syndergaard was thrown out of the game after throwing a fastball behind Dodgers second baseman Chase Utley, who had committed a controversial slide against the Mets the previous season. Video of one of the more volatile baseball ejections in recent memory has been making the rounds on social media, and the clip – with a mic’d-up umpire – shows how intense managers can get while confronting managers at the plate. Back in May of 2016, Mets pitcher Noah Syndergaard threw behind Dodgers second baseman Chase Utley in the third inning of a game in New York. Syndergaard was ejected immediately – before a warning had been issued in the game – prompting then-manager Terry Collins to come out and argue in his pitcher’s defence. WARNING: The video includes foul language. To understand what caused such an explosive display from Collins, you must go back to the 2015 postseason, when the Mets and Dodgers faced off in the divisional round. The Mets would win the series 3-2, but the most memorable moment of the series would be in Game 2 when a questionable takeout slide into second base by Utley broke the leg of Mets shortstop Ruben Tejada. While the umpires ruled the play legal in the game, Utley was ultimately suspended for two games for the move, though that suspension would later be rescinded. MLB would change the rule on takeout slides before the start of the 2016 season. But according to the much-fabled “unwritten rules” of baseball, Utley still had to pay for what he had done, prompting Syndergaard attempt at a bean ball. Through the interaction, you can crew chief Tom Hallion attempting to diffuse and explain his side of the situation. “Our a– is in the jackpot,” Hallion says to both Syndergaard and Collins as they argue their case. Still, Collins isn’t having it. “You gotta give us a shot!” he pleads, in an expletive-ridden rant, criticising MLB’s lack of response to Utley’s slide. Any time managers and umpires get into screaming matches at home plate, baseball fans are quick to wonder what actual words are coming out of their mouths. Here, we got a rare and telling example of how intense those moments can get.